(Nanowerk News) University of Texas Dallas researchers have found that carbon nanotube sheets excel as underwater sound generators and noise-canceling speakers, two highly desirable traits for submarine sonar and stealth capabilities. The research was sponsored in part by the National Science Foundation, the Office of Naval Research and the Air Force Office of Scientific Research. Researchers had previously shown that sheets of carbon nanotubes can produce a wall of sound in air, without moving back and forth like traditional speakers. The latest study from the UT Dallas Alan G. MacDiarmid NanoTech Institute, reveals that nanotechnology speakers perform as well underwater as they do on land, and that one day they could replace traditional submarine sonar arrays. 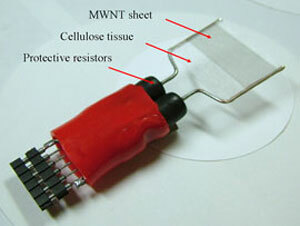 Thin, almost transparent sheets of multi-walled (MWNT) nanotubes are connected to an electrical source, which rapidly heats the nanotubes causing a pressure wave in the surrounding air to produce sound. The study was published in the American Chemical Society's journal Nano Letters ("Underwater Sound Generation Using Carbon Nanotube Projectors"). Sonar works by generating sound from an underwater speaker and collecting the sound waves that are reflected back to the sub. Sonar operators can determine an object's size, location and speed with sonar data. But, the delicate sonar arrays are expensive, they add to a boat's weight, and they do nothing to reduce a submarine's propeller sounds and other noises as it navigates the seas. Unlike alcohol or other liquids, water has an interesting effect on carbon nanotubes. The tiny tubes repel water slightly and form a layer of air along their perimeter. Once energized, the thin, light sheets of nanotubes heat and cool incredibly quickly, producing a pressure wave in the air around the nanotube that our ears and other devices perceive as sound. Led by Dr. Ali Aliev, a research scientist at the NanoTech Institute, the team discovered that nanotubes excel at producing low frequency sound waves, which are ideal for probing the depths of the ocean with sonar. The team also confirmed previous studies noting the ability of nanoscience speakers to cancel noise when tuned to the correct frequency — say, the rumble of a submarine. "Nanotube sheets can easily be deployed on curved surfaces, like the hull of a sub," Aliev said. "They're very light, about 20 microns thick, and they're 99 percent porous. Layers of nanotube sheets can be built up, each with a different function, for sonar projector applications or for control of the boundary layer losses for marine vehicles. Meaning, periodically heating the skin of a sub—or even an airplane—warms the thin pocket of air around the vehicle and reduces friction and turbulence. Or, these underwater sound generators could cancel out the sonar signal being sent out by another sub, leaving the friendly sub undetected."